IT’S BETTER THAN 60 PERCENT CHANCE SENATE REPUBLICANS WILL TOP THE 60 MARK IN 2018??? Where do practically all U.S. government income and wealth originates, 3 percent or less of the U.S. population can give the correct answer. You will get answers like all kinds of taxes, licenses, fees, tariffs, or whatever, which all will be wrong. Right answer: Directly or indirectly practically all of government income originates from some form of private U.S. business profit, no profit dough, no dole. It's like a small kid thinking all butter and eggs originates from the grocery store. CLICK HERE TO SEE GREAT WRITER’S WEBSITE HOME BASE. CAN THE USA GOVERNMENT PAY FOR AN ALL OUT WAR AND PAY FOR A WELFARE STATE AT THE SAME TIME? The answer is a flat no! 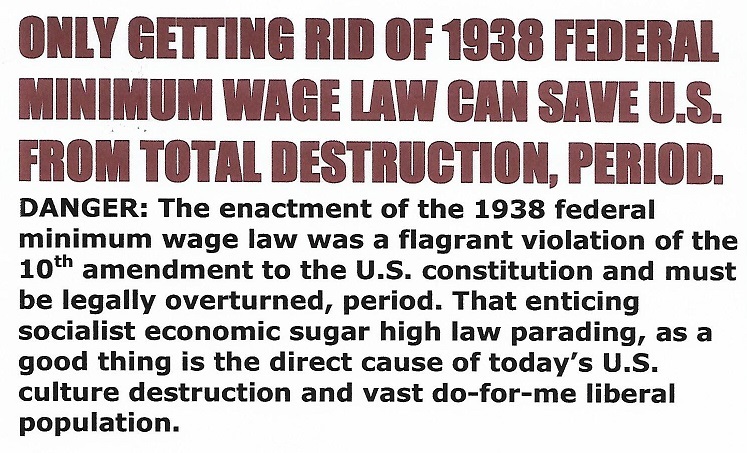 That is why it is so important to repeal “The arch-evil 1938 socialist minimum wage law” to first get the USA government out of the provider business if we are to survive, period. Trying to do both will quickly total collapse the whole USA economy without a doubt. PS: In leadership when someone bucks the tide and suffers no consequence, then what is everyone complaining about??? F. L. SIRMANS LOG: 09 AUGUST 2017, 1009 HOURS.